Master STAGES™ RINSE 100 is a washing compound concentrate that does a great job of removing metalworking fluids and light oily films. This product will not stain ferrous or nonferrous materials and leaves an extremely thin film corrosion inhibitor, which does not interfere with gauging of parts. 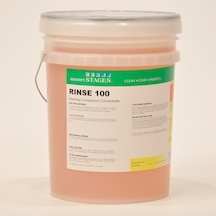 RINSE 100 is compatible with the TRIM® family of cutting and grinding fluid concentrates.